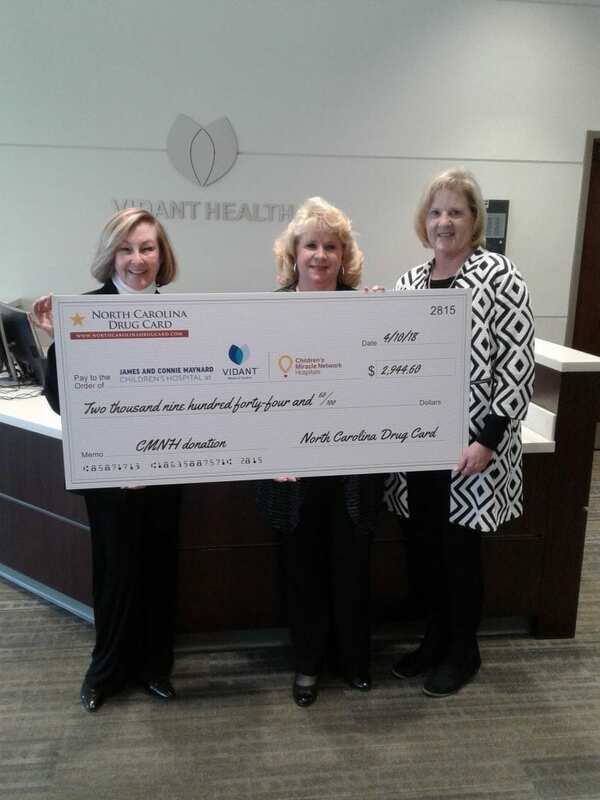 On June 10, 2018, Connie Craig and Lisa Hunneke, North Carolina Drug Card representatives, presented a check to the James and Connie Maynard Children’s Hospital at Vidant Medical Center. Rhonda James, director, was pleased to receive the check donation in the amount of $2,944.60. Following the presentation, Connie and Lisa participated in the telethon that occurred that day. It has been exciting for North Carolina Drug Card to work with James and Connie Maynard Children’s Hospital at Vidant Medical Center and their year-round fundraising campaigns along with the special hospital events held for the kids. The future is bright for James and Connie Maynard Children’s Hospital and for the children they treat. It’s important to know that each time you choose to utilize the North Carolina Drug Card, you choose to give back to your local community and for that, we THANK YOU! Remember to ask your pharmacist about the North Carolina Drug Card the next time you pick-up a prescription. Since 2015, the United Networks of America partnership with Children’s Miracle Network Hospitals has raised over $2.4 million dollars for local children’s hospitals. Of this, $2,944.60 has been raised for James and Connie Maynard Children’s Hospital .